When will I learn? DIY facial masks and I don’t mix. However, before we get to that, let’s discuss what did work: the outfits. Not quite the same but I was warm outside which is what mattered. The only problem was the wind kept blowing my hat away. Oh, but I love hats. I have a nice collection and used to wear them in San Francisco all the time to keep my hair dry-ish from the constant dampness of the fog. I think I’m going to start wearing them more. 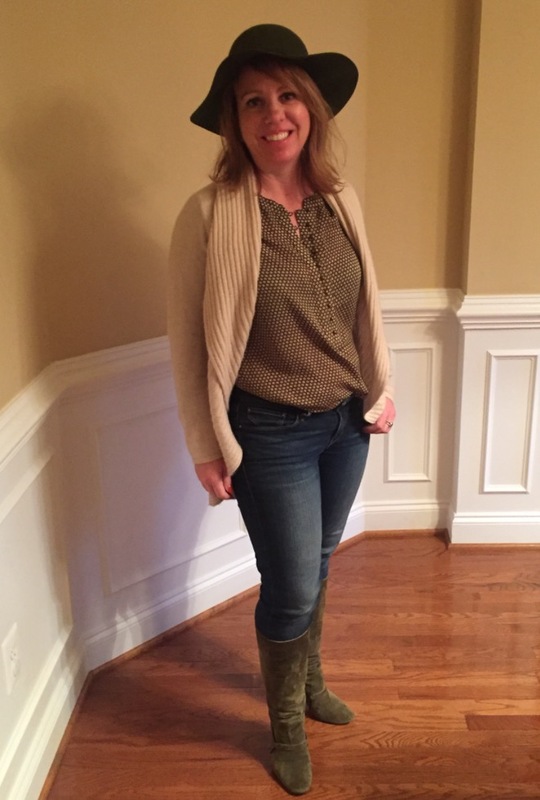 I also did this outfit. 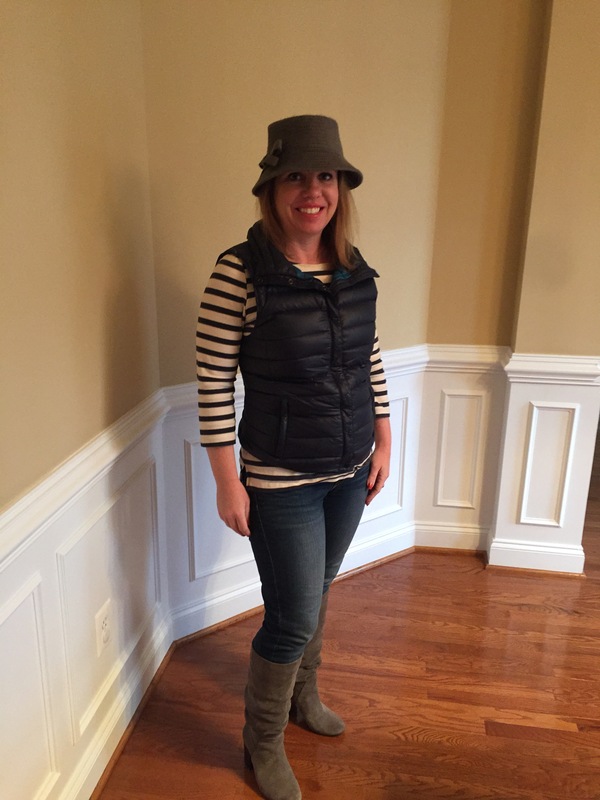 Basic and no Pinterest pin to base it off, but I think the stripe shirt/puffer vest/skinny jeans/boots/hat combo is something I could find on there if I wanted. Now onto the fun stuff: the lotions and potions. Yesterday, kittens, I tried a DIY lip scrub based on Lush’s. I think it work really well and tasted great (anything I put on my lips needs to taste good). 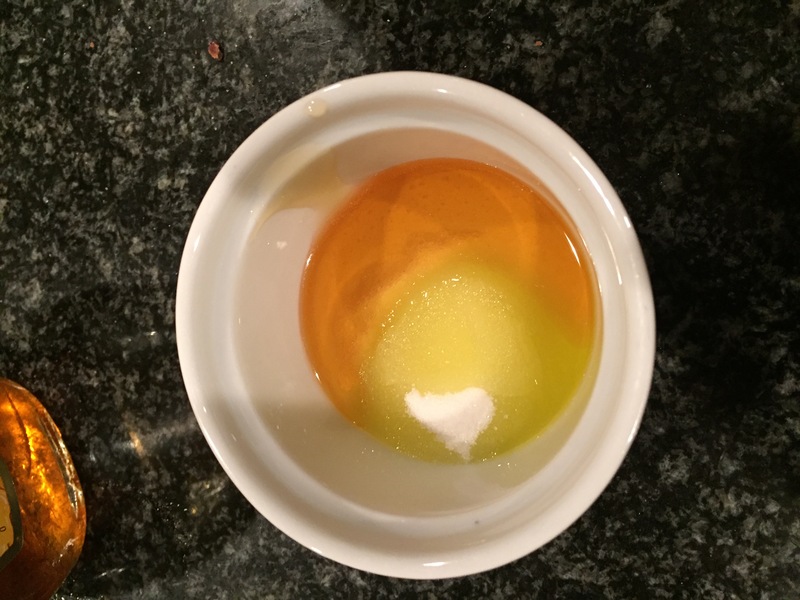 It was really simple too: sugar, honey, olive oil, and vanilla. I skipped the food coloring because I had the good sense to know that it would push the WIN into a FAIL. Can you imagine food coloring all over my lips? It would be Turmeric 2.0. The concoction before the Colonel got to it. Once again, this child had way too much joy mixing up the ingredients and encouraging me to smear it on my lips. Only after I told him it tasted good, did he try it. Which resulted in a “I’m being poisoned” face, gagging, and a vigorous scrubbing of the lips with water. So, while I liked it, the Colonel thought it tasted terrible. Next, I decided to try out a face mask. This one promised to brighten skin, make it smoother, and eliminate blackheads. It required one egg white, beaten, and tissue paper (like what you blow your nose on). When I explained what I was going to do, it was met with a collective groan from the males in my family. Kinda zombie-ish for Halloween right? With this mask, you paint egg white all over your face, place tissue on top of that, then put more egg white on top of that. It hardens into a Biori type mask…or paper mache. 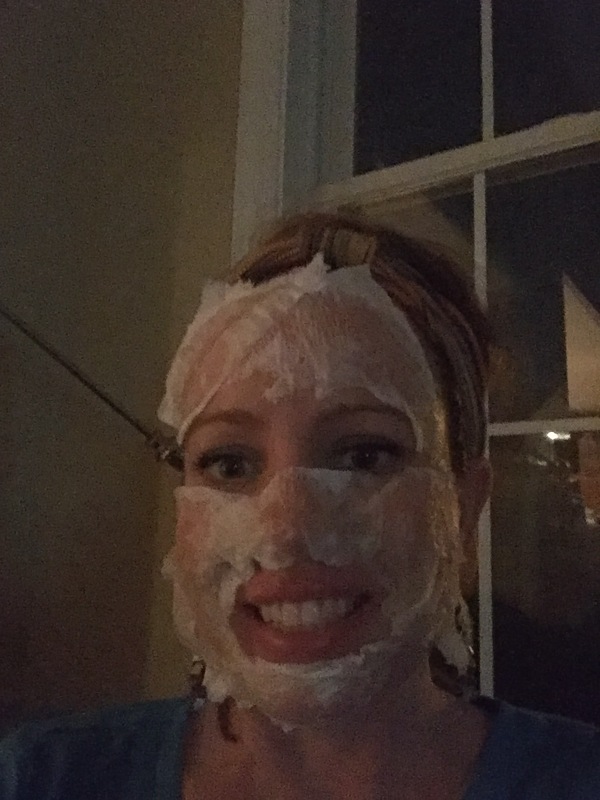 Either way, I couldn’t move my face – like Botox gone horrible wrong. I couldn’t wait for it to dry so I could rip it off. While it did leave my face feeling smoother, it didn’t at all look brighter, and the few black heads I have stayed put. So I’m marking this one up as a FAIL. And in parenting fails, Halloween is my favorite holiday other than the Fourth of July. I had grand plans to paint and carve pumpkins, but we’ve been unable to get to a pumpkin patch this year. So I bought a couple of the carvable fake ones at the craft store. 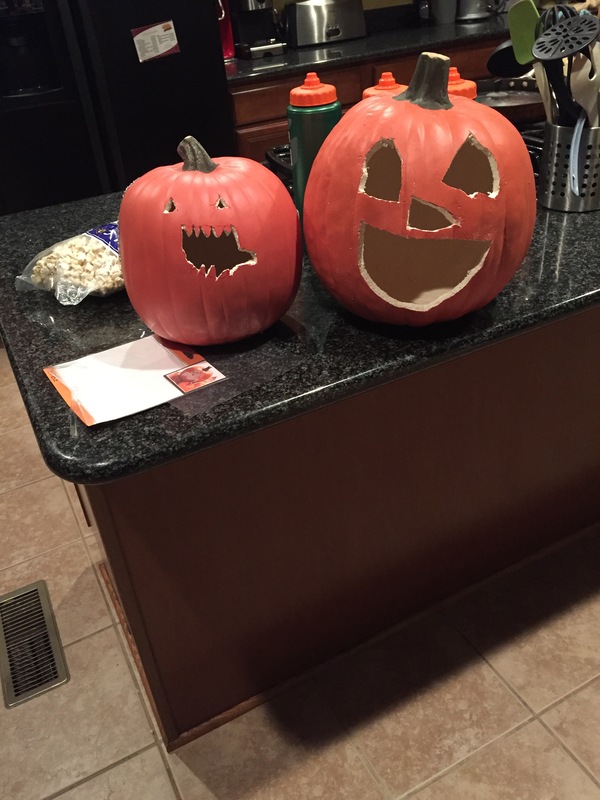 I told my boys it’s the same thing – you cut holes in the pumpkin and even better, you get to keep it! It never goes bad! Here’s what they did. Definitely not Pinterest worthy, but I love them. So this weekend I had more WINS than FAILS. However, I full expect to be failing the rest of the week since I have this and this planned.